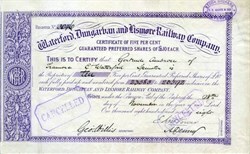 Beautiful certificate from the Waterford, Dungarvan and Lismore Railway Company issued in 1878. This historic document has an ornate border around it with the company name centered on top. This item has the signatures of the Company’s Directors, and Secretary, and is over 133 years old. The Waterford, Dungarvan & Lismore Railway Company, was set-up in 1872. This 43 mile stretch of railway was the most expensive line to be built in Ireland at the time, as it followed the most difficult route of any railway in the South. It was a very hilly line with a series of sharp curves, a tunnel 418 feet long near Durrow and two viaducts, one at Durrow and the other at Ballyvoyle. It also included a great number of under and over bridges and three road crossings at Dungarvan. Waterford's fourth railway line opened to traffic on 12th August 1878 and it was considered the most scenic route in Ireland with the most amazing views of the ocean and the lush green countryside through which it travelled. There was a steep uphill gradient from the station for the first half a mile, from where the line ran on a fairly level course through one of the sharpest curves on a standard gauge line, situated south west of Mount Congreve thence on to the first station, Kilmeadan, from there, the line followed a succession of up and down gradients until it reached the coastline before Dungarvan. From here on, the line was fairly level with a gradual rising gradient between Dungarvan and Lismore. From Dungarvan onwards towards Lismore there were many level crossings. One crossing at Dungarvan over the main road to Waterford, known as the "Causeway" level crossing was the longest in Ireland, and rumoured to be the longest in Europe. The hilly nature of the line meant it was neither fast nor frequent. The stations along the route were Kilmeadan, Kilmacthomas, Durrow and Stradbally, Dungarvan, Cappagh, Cappoquin and Lismore. In August 1882, Carroll's Cross was added as a halt. The Duke of Devonshire, whose Irish baronial seat is at Lismore Castle, was the main shareholder and its chairman, hence the line became known as the "Dukes Line". The revenue of the line was derived from both passengers and goods. Waterford was a rich agricultural county, exporting live stock to Britain. Businesses in the Cappoquin area were active in the exporting of bacon and salmon from the bountiful river Blackwater. Passenger traffic was busy going both ways. Cross channel passengers journeyed to Ireland on holidays and on business, while Irish people went to Britain to find work with many using it as a first port of call before emigrating to America and Australia. Local traffic was most frequent in the summer months when, residents of Cappoquin, Lismore and Kilmacthomas used the line to travel to the beaches in Dungarvan. Excursions known as "bathing trains" were run regularly throughout the summer. On the day of GAA matches trains were busy catering for the crowds travelling to the games. In its heyday, this railway had several passenger trains per day and at weekends the two local stations, Kilmeadan and Carrolls Cross would be a hive of activity. Farmers used the railway to transport livestock from place to place, cattle sheep, pigs and beet were the general cargo. Owners of Public houses had their cask of ale delivered to the local station to be picked up by horse and cart. In 1923 the G.S.W.R. was amalgamated with other railways to form the Great Southern Railways. On 1st January 1945 the railway was taken over by C.I.E. and they operated the line until 1967 when on 27th March the line between Mallow and Waterford City was completely closed to passenger and freight traffic. The line was dismantled between Mallow and Dungarvan. The Dungarvan - Waterford section was retained, as a factory was opened in Ballinacourty to process magnesite from Dolomite. The Dolomite Limestone was brought from Benettsbridge in County Kilkenny to Ballinacourty in Dungarvan by train. This necessitated C.I.E. to build a 1.5 mile spur to Ballinacourty. This was completed and opened on 3rd April 1970. Twelve years later this traffic ceased after the closure of the magnesite factory. C.I.E. continued to maintain the line until 1987 when the last train was seen on the Waterford Dungarvan line. A start was made to dismantle the line track about four years later. This was done in a very haphazard way and was finally completed in 2003. The first part to be removed was the Waterford to Kilmeadan section. Thanks to the determination of everyone involved with the Waterford & Suir Valley Railway this line has now been developed as a Heritage Narrow Gauge Railway. History from the Waterford & Suir Valley Heritage Railway, Co. Waterford, Ireland.